calendars, pocket planners, stress balls, magnets, business cards! - WE'VE GOT IT ALL!! NO HIDDEN COSTS - All Prices are Listed. 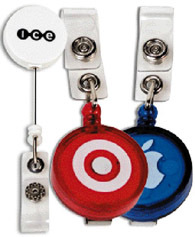 With your firm imprint or logo, our promotional badge holders, make great promotional items. See our wide choice of badge holders below. These items will make a big impression to promote your business by advertising with promotional products.. This means that everyone will see the badge holders with your company imprint or logo, use them, and think of your firm when they need your product or business. It is also a great way to promote a specific event. Lowest price starting at: $0.94 each. 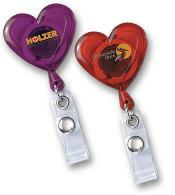 Description: Lightweight, heart-shaped design sends a caring message. Features 30" sturdy nylon retracting cord, strong snap lock and slide clip on back. There is a 6% surcharge on orders shipped to California. Lowest price starting at: $0.74 each. Imprints, logos, and trademarks displayed on our website are solely for the purposes of showing printing capabilities. They are not intended to imply any endorsement of the products by the companies represented by the imprints on the items.